"Do you think you could ride one of these off road?" "I might be able to", I said, and so the idea was born; why had I got three motorbikes and never expressed a desire to go further afield on them, to have a small adventure when travel was what I wanted to do? So the search began for a suitable travel machine – for people with short legs as I am constantly reminded of. Eventually one became available and smart swift action from Ian secured Beryl the "yellow" Peril, a BMW G650 X Country for me. Time now to really start planning. Some modifications needed to be made, an extra fuel tank fitted to increase the range, a bash plate to protect the engine and a "hard part" to protect the side stand, hand guards and some knobbly tyres and I was almost ready to go. A minor service, new front wheel bearings and some brake pads completed the picture. The ferry was booked, three weeks secured off work and a list made of only essentials to take. Two small bags of clothes only allowed – a challenge to travel light. Ian completed a plan of where we would go and what we would do over the forthcoming weeks. We decided that serendipity was the best option in terms of somewhere to stay in case I could not manage, got too tired or one of us became ill. Ian gallantly decided that he would carry most of the luggage and the spares as I would have enough on my plate, as it is only just over two years since I passed my road test. We left Malvern (after an epic tyre changing session) on a dry slightly chilly evening to travel to Portsmouth to catch the ferry to Spain. After about thirty miles it decided to start to rain and I was soaked by the time we rode on board. There I met my first challenge, a steep metal ramp downhill into the bowels of the ship – I inched my way down very slowly. The bikes were secured and we made our way to the cabin for the crossing. 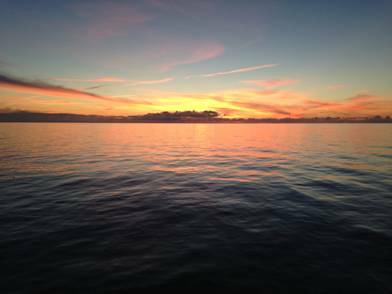 The English Channel was quite rough and luckily enough the following morning dawned fine and bright and we crossed the Bay of Biscay arriving in early morning sunshine in Bilbao after two nights on board. We set off about eight a.m. to cross Spain, planning just one night there before crossing over into Morocco. 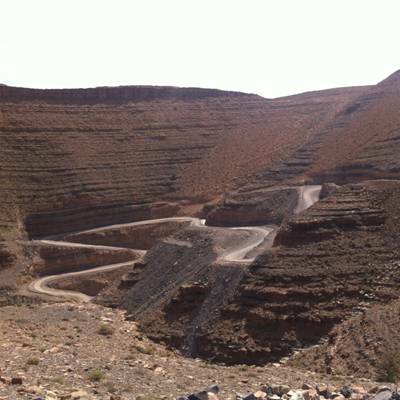 Due to the inefficiently of my insurance company one of the first jobs was to get bike insurance when we got to Morocco. Are people so badly educated that they think Monaco and Morocco are the same place? Apparently yes, and by the time I had discovered such stupidity it was too late to sort anything else out. Never mind all the web sites said, it was easy to purchase when we got there. A cold early morning ride across the Pico's de Europa with stunning views saw us eating up the kilometres, stopping every now and then for fuel or a coffee. Lunch as I was soon to learn in Spain is egg and chips, but the thought of all the calories I was burning justified it in my books. I had omitted to learn some Spanish for this leg of the journey which was a bit shameful really, and I must do better next time. "Get by in Spanish" already purchased from eBay since our return! An overnight stop in Merida in an enormous hotel with a cavernous room (my thoughts were they must be laundering money) saw us well rested and on the road after more chips for dinner bright and early. A minor panic ensued when I managed to ride off without my rucksack but luckily we were able to retrace our steps and retrieve it from the hotel car park quickly – oops! Our lunch stop brought with it bad news in that a neighbour of Ian's had died suddenly that morning. Although I had not known her long Christine had become a friend and I was glad I had passed some time with her the previous week. We sadly set off for the port of Algeciras and could feel the temperature start to rise as we travelled south. A swift weaving in and out of the usual touts and return tickets were purchased and we just about made in on to the ferry, the ramp being raised behind us. As the temperature was rising I removed most of my thermals on board as we sailed past Gibraltar. I had a rummage in my small travel pack to swap over gloves to lighter ones and found my sunglasses had got bent and lost a lens. The joys of travelling by motorcycle, but we had a good laugh about the state of them. Before we knew it we were in Ceuta – which although is on the continent of Africa is still Spain and it was a short ride to the Moroccan border. What chaos, people and vehicles of all shapes and sizes, people getting cross, and everyone jostling for position. Lots of signs saying do not use your horn; and yes everyone was!! We pushed through on our bikes, dodged the touts and got the forms to fill in for importing our bikes into Morocco. Ian took them off and came back with them duly completed and we thought we were done and dusted. After a short amount of pushing and dodging we got to the border and were told to get our passports stamped as the official had not done it when he did the bikes. So we parked up, Ian went off and I stayed with the bikes. I waited and waited, watching all life pass through the border, bribes taken, people singled out, people waved through – there seemed to be no rhyme or reason to it. Eventually after half an hour Ian returned telling me how he had had trouble as the border official did not believe he was on a motorcycle. But he had his stamp and now it was my turn. I headed to the same booth – ready to do battle, and prepared for a long wait. I handed over my passport, my entry paperwork and demanded the stamp was made please (in my best French). It took all of about 15 seconds from start to finish!!! We were away and through the border heading to the coast. 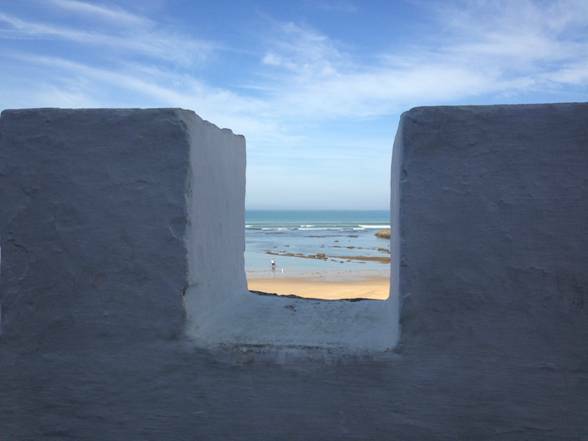 After a short ride we changed our Euros into Dirhams and hit the Autoroute arriving in the pretty town of Asilah for the night. £1.50 for secure parking for each bike for the night and £30 for us in a double room with views of the sea. Not the smartest establishment but the bed was clean. After a shower and a decent fish supper (shared with the local stray cats) we went to bed and I slept very soundly. The next day dawned fine (no surprise there) and we went in search of some insurance. The local insurance broker was definitely not interested and said we needed to go to the next town and find AXA International and they would be able to help. After a good breakfast of local pancakes, bread and omelettes we headed off to get the insurance. A chance encounter when I stopped to ask for directions and the chap marched me round the corner straight into the offices and I purchased the world's most expensive short term motorcycle insurance. The girls in the office were very impressed we had ridden from England and I was riding a bike as a woman. We filled up with fuel and had lunch in a large service station. Many tagines were available and while I was debating which to have the waiter took me back into the kitchen and let me choose which one I would like. They all looked delicious and I chose the best looking one that was not too large. Ian had kebabs which were ordered by the kilo from the butchers next door – very fresh! 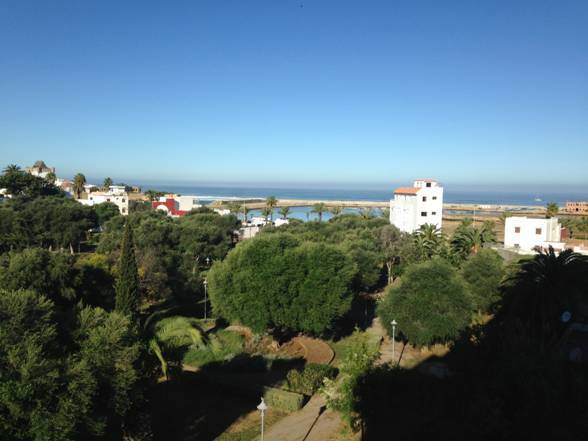 We hit the road again and headed for El Jadida stopping at an Ibis Hotel on the sea front for the night. After breakfast we tipped the guard, climbed on the bikes and tried to escape the town. After a futile attempt, we stopped, I took the map and went in search of directions. Entering a public office of some kind I explained where we were trying to get to and what road we wanted. (Speaking French helps so much in these situations). The two gentleman said it was tricky, closed the offices, got in a car and escorted us out of the town to the road we wanted – an extreme act of kindness. I told them they could just point us in the right direction but they refused, and insisted they help us and guide us!! One of the scariest parts of the trip was riding around the capital city of Rabat. It was complete chaos, lorries, cars and wagons pulled by donkeys all just pull out in front of you. Ian led the way and I tried to keep up and not get cut off by the traffic – we got out the other side unscathed, but my heart was beating so fast as it was terrifying. Earlier that day we had come across a road accident where a lady had been hit and killed by a truck – which was itself in a very bad way in a ditch. The body was in the middle of the carriageway and covered up. It struck me how little drama there was about it all. A policeman was wandering around, but what a contrast to the flashing lights and road closures of the UK. Death in whatever guise is dealt with in a very matter of fact way. 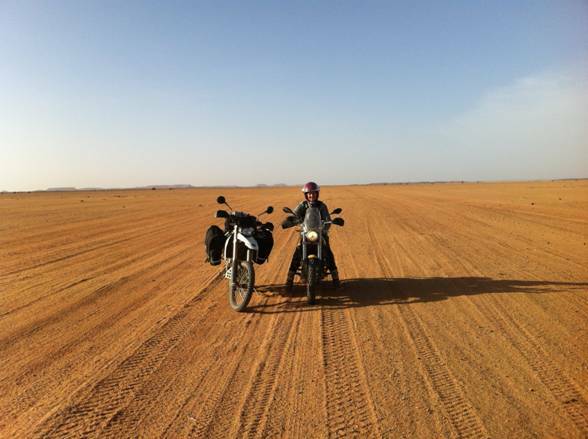 We pitched up in Essaouria in the late afternoon sunshine and as we had covered quite a few kilometres by then we decided to treat ourselves to a day off and rest up. The first evening Ian decided to get his hair cut and for the princely sum of around £4 had a half hour trim – what a bargain. We had a good supper washed down with some decent red wine and retired for the night. The following morning Ian wanted to search out a piece of sheepskin to go on his bike saddle as the seat is not very comfortable. After wandering around the Medina we eventually found someone sat on a stool covered with sheepskin and expressed an interest. After much debate in Arabic someone rushed off and came back with one. It was too expensive and too big, we further explained what we wanted and again someone appeared with another piece which was what we wanted. We then had to haggle quite a bit and they drove a very hard bargain. Ian was now the proud owner of the world's most expensive sheepskin to match my insurance policy. It had obviously been removed from someone's house! That evening we wanted to eat somewhere different and were tempted into a restaurant by the waiter, we asked him did he serve red wine as many establishments do not serve alcohol. He said "yes", and sat us at the back in a corner where we could not be seen. We haggled over the price of the wine and he assured us it was very good, so we ordered. Eventually a lad arrived on a moped with a plain carrier bag which was our wine, it was handed over very furtively – money changed hands, it was opened and placed behind the plant pot so it was hidden from view – it was very good too. We set of early the next morning for the long ride down to Tan Tan which was as far south on the Eastern side as we were heading. 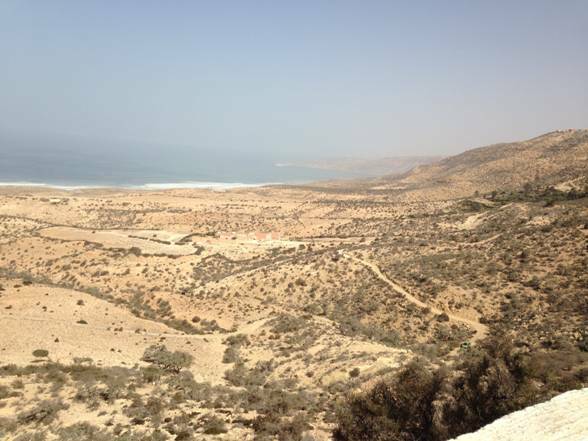 We stopped for lunch in the surfing town of Tagazoute and continued south. Ian escaped being knocked off his bike in Casablanca by a woman in a large white four by four who never looked and just pulled out!! Maybe four by four drivers are the same the world over. We arrived in the dark in Tan Tan – by this time it was getting hot. The recommended hotel had seen better days, but they had a room at £20 for the night and free parking in a barn at the back for the bikes. As grotty as it was the bed was clean. After a shower and washing of our clothes, which would dry overnight easily; we headed out in search of beer, but horror of horrors it was a dry town!! Luckily we had packed some malt whisky so had a slurp each of that and enjoyed a nice meal of chicken and chips in the main street at a pavement café. Ian could have swapped me for a camel with the local wheeler and dealer, but luckily was too tired to think of that whilst the chap was paying me compliments. The next morning the big day had now arrived, it was time for my first off road experience. To say I was terrified was an understatement. I had read the description of the route and it mentioned that you needed to have been on a spinach diet first – really scared now. I was determined to ride like Lois Pryce the adventure bike rider and not Lois Lane!! I turned off the ABS and we set off on the first piste or track. There was a steep descent immediately and I do not like these, but little by little I inched my way down. The gravel was a bone shaker and I had to stand up to keep control of Beryl. After half an hour I was so hot it was unbelievable. We got to the bottom and Ian rode my bike through a tricky rocky section. I climbed back on and we then continued. My first "off" then happened - a small patch of loose gravel saw me crash into a bush. It hurt, shocked me and my pride also took a nasty blow. Ian came back, we righted Beryl and it took me a while to get myself sorted and onwards we went. The track came from Chris Scott's guide book and I was wishing the poor chap all sorts of unmentionable harm. 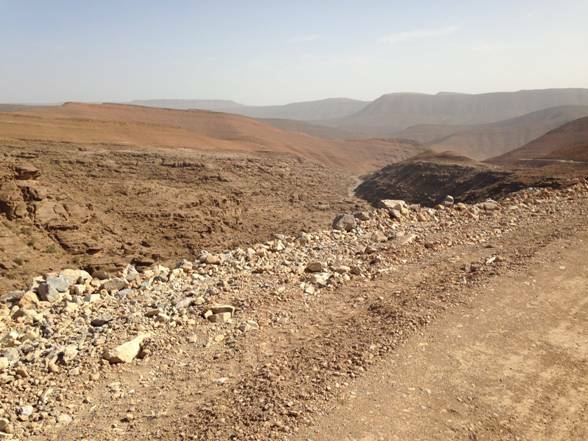 After an hour or so I was starting to get a bit of a handle of things and rode a quite difficult rocky section, various small patches of soft sand, gravel, corrugations, dried up oued (creek) beds and I was actually enjoying a bit of it now. A few more crashes and we then stopped for lunch at a small oasis. Before we came to it we stopped at a well and refilled our water bottles. Lunch over we had to rejoin the track and getting out of the soft sand was difficult. Too hard for me so Ian rode my bike out and I helped him right his when he lost it too. The day continued through beautiful scenery, and the going was very varied. I was scared, out of my comfort zone but also at times enjoying myself – not many women my age would even think of doing what I was doing. We pushed on and the possibility of a night in the desert was looming. After some calculation with the GPS we decided that with some real effort we could get to the end of the track and to the town of Assa. Towards the end we were on part of a Paris-Dakar rally route on salt flats and that was great going, fourth gear and stood up. It was getting dark by now but we were not far from the tarmac so kept going. Riding at night in Africa is not good as you never know when a Donkey or a Camel might wander out into to the road. I was exhausted but just kept following Ian's tail light. We rode up a hill in the pitch dark and I was so pleased – ecstatic even, to see the lights of Assa strung out along the horizon. We pulled into the hotel car park and I had to get Ian to put my side stand down as I could not move!! I dragged myself off the bike, a room was secured and the chap who came out to greet us confirmed beer was available. Ian nearly hugged him! 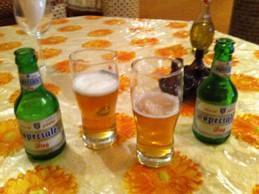 He offered to show us the room, but I insisted on a beer first – boy was it good. The chef had already left but not to worry he would send out for dinner for us and we had fifteen minutes to shower and get back downstairs. He said they could not do food but presented us with a lovely salad, followed by an omelette with cumin then an enormous portion of chicken and chips – as tired as we were it was too much to eat but we gave it our best shot – whilst watching a Bollywood movie with Arabic sub titles. The chap running this hotel was a fantastic host and wasted where he was. The next morning after a good breakfast – too much to eat again, we left for the next track which was billed as easier. I had a nasty burn on my calf from the exhaust and covered this up well. The tracks on this ride were bumpy and rough but the terrain was not too challenging compared to the day before. Some of the climbs were terrifying though, but I just kept going, yelling at myself to get on with it. Chris Scott mentioned in his guide book "that your radiator will be screaming by the time you get to the top" – he did not mention your girlfriend will be too!! 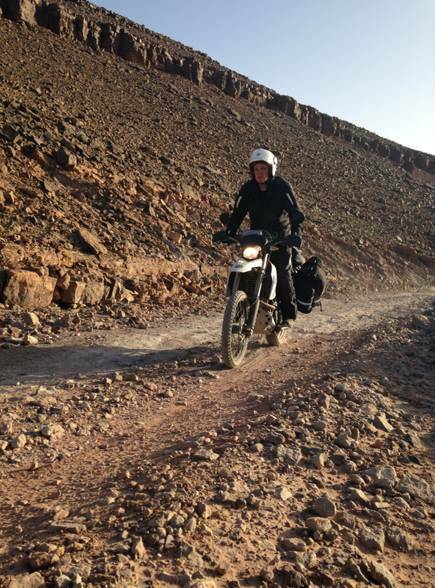 I completed the day without falling off – yeah (thankfully) and we stopped in Tafraoute for the night. Following Ian on the tracks I felt like Wily Coyote following the Roadrunner as often all I could see was a ball of dust in the distance. On the bikes again the next morning saw us heading via Tata to Zagora for the long track we were planning to ride. It was a long hot ride, 42 degrees C in one town we went through, with sealed roads that were more like cart tracks at times – I actually had to stand up they were so rough in places and a difficult search in Tata to find somewhere open for lunch. Ian needed to eat and was getting grumpy but eventually we found somewhere and had a good meal (shared with the local cats of course). We got a bit delayed as the road had a lot of deviations onto tracks as it had been washed away in many places and we came across a wedding party which blocked the road too. 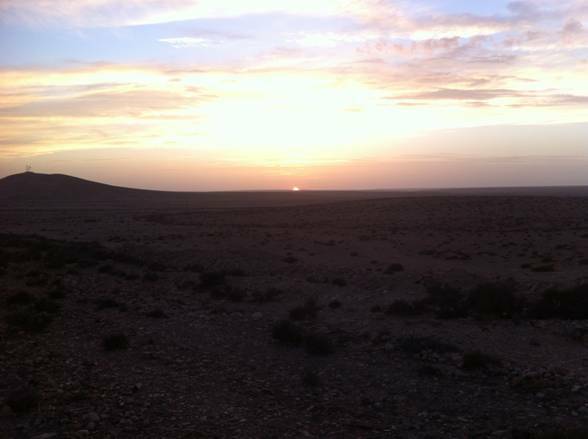 It was dark when we reached Zagora and secured the last room in a large hotel that was hosting a festival of some kind. Dinner was a large buffet and this was not a dry town so we had a good evening. After a leisurely breakfast and a morning spent plotting the way points in the GPS we set off for lunch and supplies. About four p.m. we headed off the main road to start the long track we had come to ride. It was hard to get going and find the way, but eventually we were off, every time we hit soft sand I thought I was off too, but I kept going. 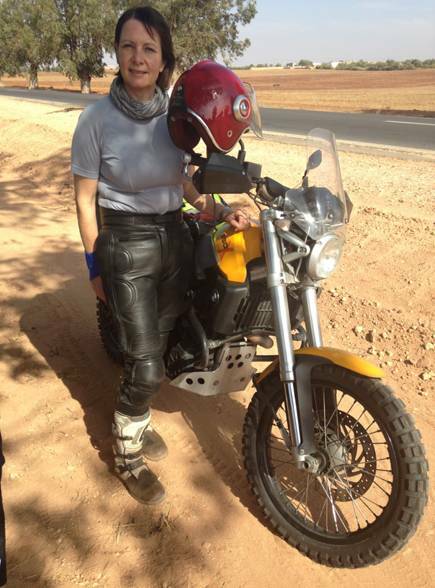 I rode some hard bits, then fell off again – once as I was coming to a stop through exhaustion!! Another shower from a well and a military check point passed. A pep talk from Ian saw me ride a really tricky hill and it became time to stop for the night. It was getting dark and we chose an oued bed as it had some flat rocks. We unpacked, stowed the bikes under the bank below the track and ate our supper. The silence was quite wonderful, all-encompassing and the stars started to come out - layer upon layer upon layer. It was not really dark at all, shooting stars shot across the sky and we started tracking satellites. With no tent and just a sleeping bag and it was not so cold as the rocks had held the heat from the day. There were a few mosquitoes which were annoying and a small jerboa (nocturnal wild gerbil) tried to steal our bread in the night but we managed to rest and rose at dawn to continue the track. Kilometre after kilometre passed and the scenery changed again, and we met more sand. Another well to refill our water bottles and a further military checkpoint. The guard mentioned that they don't see many women up there and certainly not many women on motorbikes. It made me feel quite special! He kept apologising for having to record our details and also told us that two weeks ago they had had heavy rain and the whole area was flooded and that we would not have got through. 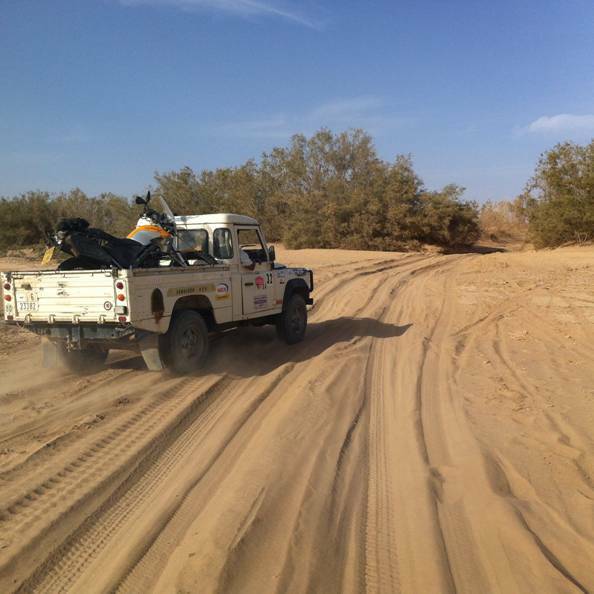 On we went again and met more sand and I started to come unstuck more and more. I managed to get my foot wedged under the fuel cap on one off and Ian had to come back and rescue me again. On we went and my legs were starting to hurt now. We stopped for coffee at small Auberge in the middle of nowhere and I was not thrilled to be told the route got very difficult from there onwards. I kept telling myself that every metre was another metre nearer the end of the route. I managed to fall off again in some soft sand near to another Auberge where we decided to stop for lunch. The locals saw and as they all have mobile phones they had a plan for later forming already which will become apparent. We had a meat stew with eggs and bread, washed down with Fanta – excellent for helping with dehydration!! We set off again and the going now became very tricky. The hard packed rock strewn sections were not too bad, I kept telling myself what to do and to "get on with it". A few more offs saw me really hurt my shin (cracked the bone I think) and although it hurt the adrenaline saw me get back on and continue. I thought it was really hard and then it got really difficult!!! I could not manage in the deeper soft sand, so Ian had to walk back and he rode my bike through the difficult sections. I climbed off once and twisted my knee in the soft sand which really hurt, and then I knew I was not going to be able to do this last bit. Then we heard a Land Rover approaching. Word had got out and their timing was superb. It stopped with two Moroccans in it - their opening words were "Do you speak any French?" "Yes" I said and so it began. "It is impossible" they said "to ride a bike through here, we'll take you to the tarmac". After much haggling they agreed to take my bike, the luggage and me; Ian would follow as he was managing with no problems. Beryl was secured I climbed into the middle of the truck cab with Hassan and Mohammed and we set off. There was a terrible smell of hot sweaty bodies and feet, oh dear; it was actually me!! They were very entertaining speaking to me in French and then shouting at one another in Arabic, they waited every now and then for Ian to catch up after he held back due to avoid the dust the Land Rover was creating, telling me "il arrive". I was so tired I did not know what to do with myself. Ian kept following us, riding amazingly well. I was so envious of his skills; I could see him in the rear view mirror. The rest of the route was very hard and I would have really struggled to do it with my current skill level. 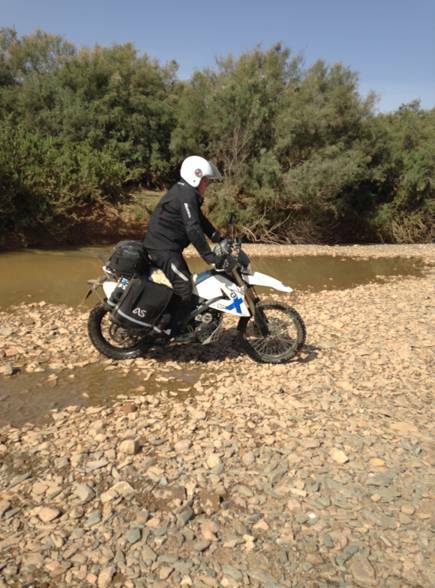 It would have meant another night in the desert, some parts I could have ridden, other bits – no chance! Eventually we reached tarmac, unloaded the bike, and scraped all of our cash together, paid the guys and they left. Whilst getting ready to ride onwards a chap turned up on his moped and tried to sell us souvenirs. He just did not seem to understand that by now we had no money left, no Dirhams, or euros and hardly any sterling. Eventually he got the message (although I am not so sure he actually did) and we headed to Merzouga. We arrived in the dark and set about trying to find a bank and a cashpoint. There were lots of touts and eventually we discovered there was no cashpoint in the town. So we then needed a hotel that accepted credit cards and not all of them do. One chap said he could take us to one, we told him we had no cash and could not pay him, he said never mind – rammed his turban on his head, hitched up his robes and set off on his moped with us in pursuit. After ten minutes we arrived at the hotel, confirmed they had a room, took credit cards and thanked our guide, another genuine helpful person who was very kind to us. He was hoping to get us on a camel trek the next day in reality. 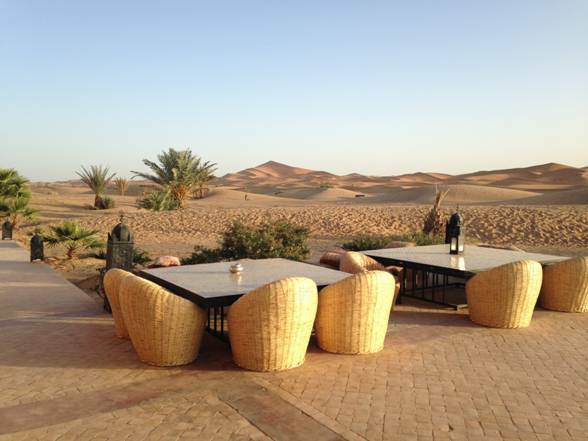 We had a really good dinner and woke the next morning to amazing views of the dunes and camels. The resident cat was sure that as we were first up if it yelled at Ian enough he would feed it! It was such a wonderful spot we asked if we could stay another day, but sadly they could not have us they were full due to a large party arriving, so onwards it was. We found a hotel in the guidebook, I rang and booked and a room and we started to head north. My whole left shin was now quite black and blue in places, I had a lot of other bruises too! We spent a nice day at the next hotel, actually managed a swim in the pool and went to bed very relaxed. Unfortunately I then was struck by a stomach bug and had to get up a lot in the night – not easy when the town had had a power cut!! Again we had to pay by cash there were no card machines working and we headed over the Atlas Mountains. Kilometre after kilometre passed, a brief stop for lunch and onwards again. Whilst stopping to check tyre pressures one lad tried to help and move my bike; he could not manage it when I could and I expect he is still being ribbed over it. "The woman could do it and you couldn't" his mates were laughing a lot at his expense. We decided to "go for it", even with me having eaten hardly anything and try and get to the coast again by nightfall. We rode on, it was further than we thought, it got dark and we made it to Asilah by about 8.00'ish. Again it was a relief to get off the bike. I was hungry by now which was a good sign and we had a simple supper in the hotel and retired. We decided to stay a bit longer and have a rest day before heading back to Spain, this was rounded off with a wonderful lunch where the "chef patron" came and spoke to us, gave us free large brandies after lunch and was utterly charming. The food was very, very good too. The next morning and we headed north to the border, this was scary as there were very high winds on the Autoroute and Ian had the bike move out from under him once, which scared him (so it must have been scary then)! We eventually arrived at the border chaos again. There was much pushing and shoving, and we got to the front, filled in the forms, had our passports stamped, exported the bikes and were away into Spain. When we had filled up earlier I had obviously not locked my second fuel cap properly and someone had stolen it – annoying, but not the end of the world. We queued for the ferry and without much ado were back on the European mainland. A quick blast north and we stopped for the night when it got dark and also cold. We headed off north again the next morning and then stopped in a place which was not quite so nice just south of Burgos. Dinner was very overpriced and the service was not great. Here is where Ian caught his stomach bug and he spent quite a bit of time in the bathroom. There was no time to be ill and we headed for Bilbao to catch our ferry and made very good progress. It was actually cold over the Pico's de Europa and we saw some fog too!! Going down the ramp to stow the bikes on the ferry was much easier for me this time around than it had been nearly three weeks ago. We got to our cabin and relaxed, Ian did not want to eat much so I purchased vastly overpriced sandwiches and wine which we consumed in the cabin. Again the Bay of Biscay was so calm we had a really good rest. The morning dawned bright and sunny and we made good time back to Portsmouth where it was still warm and sunny when we arrived. I changed the clothes I was wearing as I did not need all of my cold weather gear and we headed back towards Malvern. Just before six o'clock saw us arrive back, 3801 miles covered in total. No mechanical breakdowns, no punctures, two lost indicator lenses, a DIN accessory plug that fell apart and a stolen fuel cap was the extent of the bike damage. The cartilage in my left knee is another matter, but the bruises soon faded, and the burn healed without incident. I still can't believe I actually did it, it was awesome, definitely the adventure of a lifetime.